As the idiom says, “everything old is new again,” and hair scrunchies are a great example. Wildly popular in the 1980s and 1990s, these covered elastic ponytail holders are experiencing a comeback tour of their own. Whether you use fabric or ribbon, make narrow or wide, simple or fancy, they are easy to make at home. Fold 1/4 inch of fabric at one of the short ends toward the wrong side of the fabric. Press the fold. Fold the fabric strip in half lengthwise with right sides together. Pin the elastic along the fold, aligning the end of the elastic with the unfolded short end of the fabric. Stitch along the unfolded short edge and along the long edge, using a 1/2-inch seam allowance. Trim the seam to 1/4 inch. Turn the strip right-side out, pulling the elastic out of the tube on the pressed end. Press the seamed edge of the fabric tube flat. Overlap the ends of the elastic by 1/2 inch and hand stitch them together, making a circle. Insert the unfolded end of the tube into the folded end, overlapping them about 1/2 inch, making a circle. The fabric will cover the elastic circle. Hand stitch the ends together to close the tube. Cut the ribbons into 8 1/4-inch lengths for a 4-inch wide scrunchie. Adjust the length of the ribbons to change the scrunchie size -- the ribbons need to be twice the finished length plus a little for tying. Lay out the ribbons in the desired pattern if you are using more than one color or width. Tie the first ribbon around the elastic band with a simple overhand knot. Tie the second ribbon on the band and slide it as close to the first as you can. Repeat until the band is covered. Embellish your ribbon scrunchie by tying beads onto the loose ends. Embellish both types by gluing beads, rhinestones or other “bling” on with fabric glue. 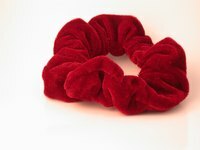 Any type of fabric works for a scrunchie. If you choose a see-through type, like organza or gauze, you may want to double the fabric before folding and stitching it. Vary the size of your scrunchie by using narrower or wider fabric strips. You can also change the fullness with longer or shorter strips. Avery Lane Designs: Are Scrunchies Really Back?